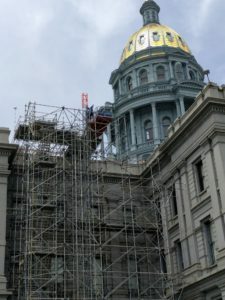 The sine die gavel was still ringing in our ears when construction projects began anew this spring at the Colorado state capitol building. Much like the laws in our state, the building where those laws are made is itself a work in progress. Over the past two years, the interim (mid-May through late December) has seen tremendous restoration work completed in the people’s house. The Senate and House chambers and their magnificent chandeliers were restored to former glory, and the Senate committee rooms received a welcome face-lift. 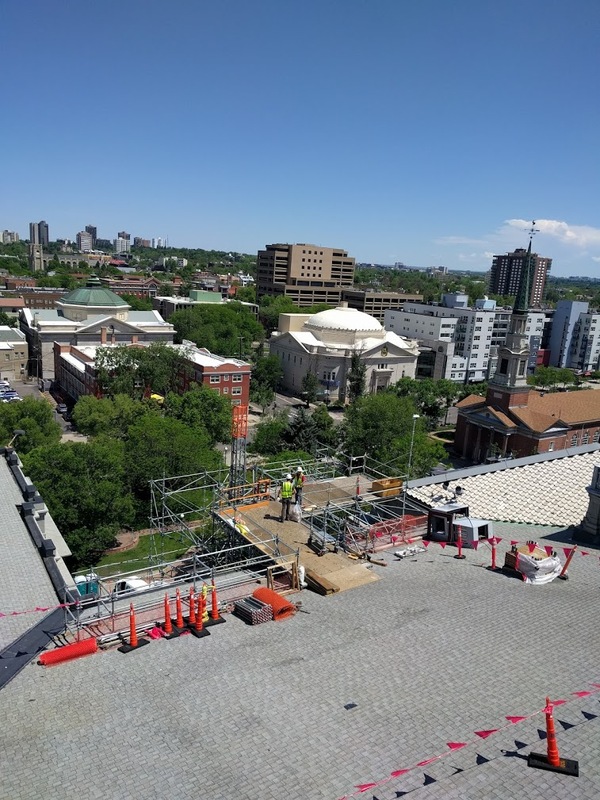 In 2017, the House committee rooms in the basement are undergoing a significant renovation and various ongoing projects are underway on the roof of the building. Kudos to the architects, engineers, construction workers, capitol staff, and everyone else involved in beautifying and restoring this grand old building. Stay safe out there! 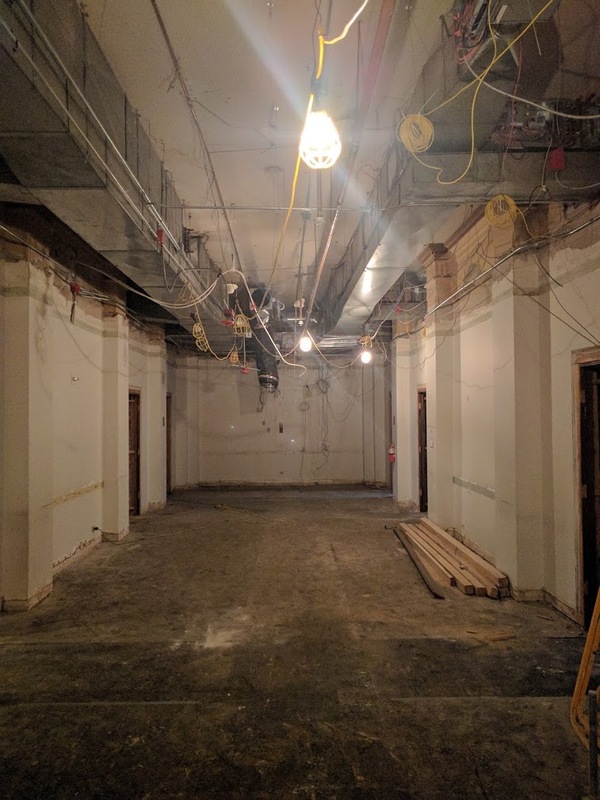 Marilyn Eddins, Chief Clerk of the House of Representatives, recently gave LegiSource a sneak peek of the renovations happening in the basement committee rooms. “No more high school classrooms,” she said with a smile as we walked and talked about the updates underway on the ground floor. 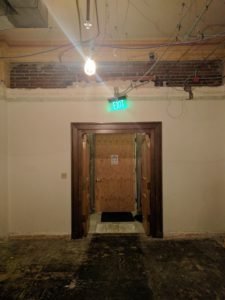 In the lobby of the committee rooms, where legislators, staff, and the public converge, brick and egg-and-dart crown molding that have not seen the light of day in decades have been uncovered by the construction crew. 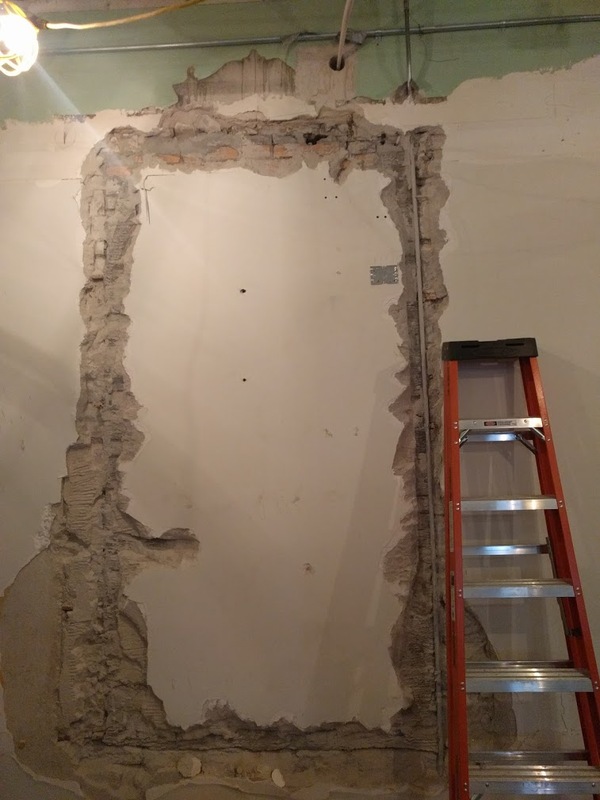 The crown molding will be on display once again upon completion of the renovation, and a portion of the brick might remain. Exposed brick and egg-and-dart crown moulding in the lobby. The tiny “Doc of the Day” room – 106 – is being repurposed as a small committee room with a table for 12. Room 107 is very exciting. Gone is the vertigo-inducing diagonal table. In its stead will be a straightforward, beautiful marble table. The St. Louis Antique Lighting Company, which restored the chandeliers in the House and Senate chambers, is custom-making two gorgeous lamps that will hearken back to those that hung in the room more than a hundred years ago. At that time, the room hosted a mining collection that boasted dozens of cabinets overflowing with stone and minerals including quartz, onyx, copper, silver, and gold (The Colorado State Capitol, Everett, p. 83). 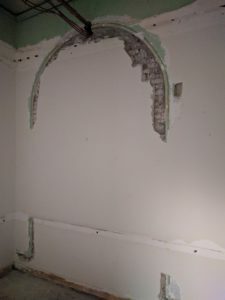 The renovation has already revealed an archway in Room 107 that once led outside the building. Hopefully, the room’s new look will showcase that unique architectural design after the renovation’s complete. On the left as you walk into the lobby, rooms 111 and 112 will be combined into one large room to mirror the design of matching senate conference rooms on the third floor. In 112, the renovations have revealed interior windows facing the lobby that were covered up long ago. There will be windows in this wall once again; however, they will be glazed so that light may pass but the inhabitants of the committee room won’t feel like zoo animals. Coming in 2018: Glazed windows in this spot! 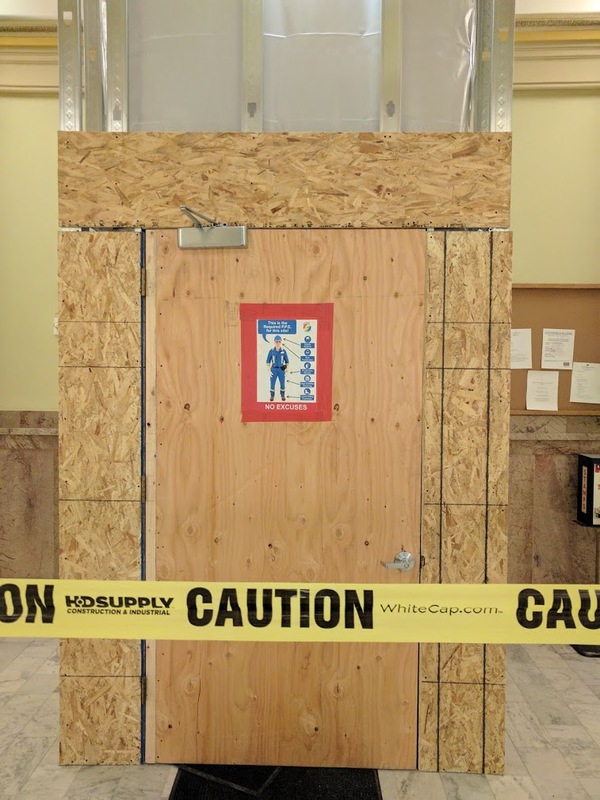 Finally, at the rear of the lobby, a double egress will now lead to a vestibule and another exit from the house committee rooms to the ground floor. 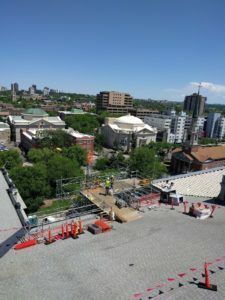 “At the peaked ends of the roof, we are removing the tile roofing and replacing it with gray slate, which was the original roofing material. The asphalt shingle locations were originally slate, but due to the low slope the original slate failed. At these areas we are installing a zinc-coated copper to go with slate on the ends of the building. We are installing new skylights over the preserved original skylight frames. “The scaffolding that has surrounded the building is for the gutter replacement. The gutters were originally lined with asbestos and copper. Over the years additional layers of material had been added as the gutters leaked. We are going back to the original look by removing the old gutter materials, abating the asbestos and installing new copper gutters. “The iron rain leaders for the roof were lined with a plastic pipe sometime in the past, reducing the capacity of the drains by 50 percent. We are removing the plastic pipes and lining the original rain leaders with fiberglass and returning the capacity to the original design. “The flag pole has been replaced with a new pole with detailing from the original drawings. “The original chimneys for the steam boiler and the bathroom vents were removed sometime in the past. We are recreating them from the original plans and old photographs. Hats off to the construction crew! 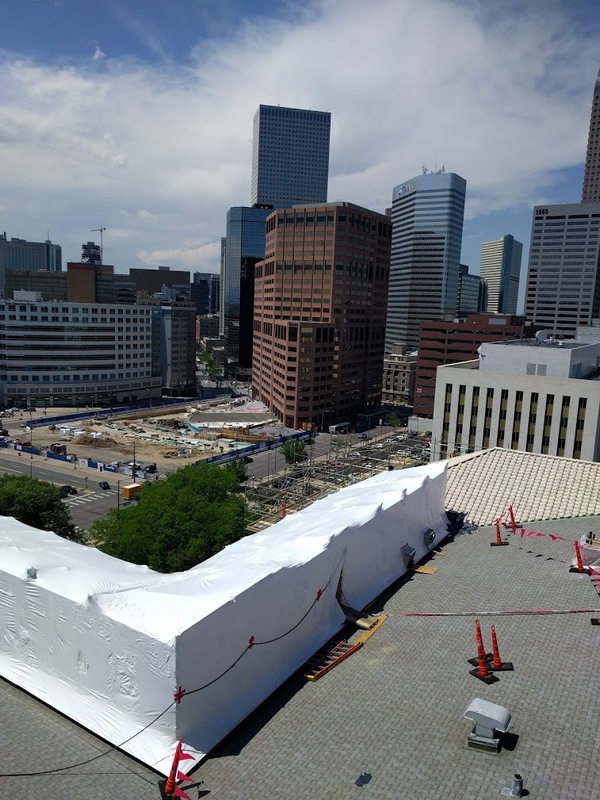 “Beneath the roof, in the attic, we have been dealing with asbestos fibers that remained behind from an earlier project when asbestos was not a material of concern. Due to the disturbance on the roof from both removing old materials to adding new materials, the asbestos has been [treated with a sealant material to prevent the release of fibers]. 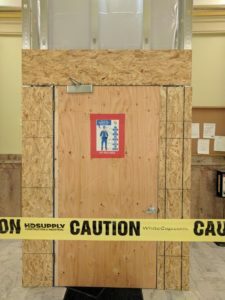 The replacement of many of the building’s exterior windows and granite cleanup could be blog posts in themselves, but it’s plain to see there’s a lot happening inside and outside of the state capitol. Of course, the public is still welcome to visit and tours are happening daily. Pardon our dust!